Command Guru srl has announced the release of Sally Park 2.0.1, an update to their popular car finder app for iOS. Let Sally Park guide you. Always find your car immediately and never get a parking ticket again. 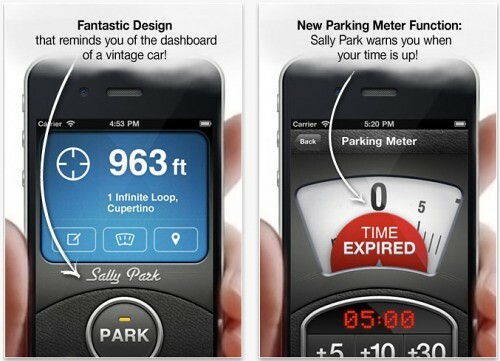 The new Sally Park will help you find your car in any parking lot among thousands of vehicles and alert you before the parking meter time is up. Set the parking space with a tap, and easily add a photo and notes to help you remember the floor or section. Configure the Parking Meter expiry and check the distance between you and the car on the Map. Use the Compass and Radar to know where you are. You will be able to find your car in even the most confusing parking mazes! Command Guru's Sally Park 2.0 has a price tag of only $2.99 USD (or the equivalent amount in other currencies) and is available worldwide exclusively through the App Store in the Lifestyle category. Special Launch Price: Only $1.99 for the first two weeks.